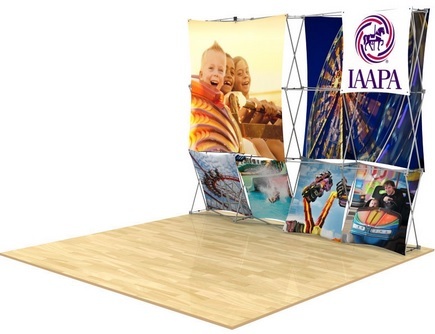 The 3D Snap 10ft Echo Display is very similar in size to most 8ft 4×3-quad pop-up trade show display systems but has a much more unique shape – ideal if you are trying to create a more modern look for your company. The excitement of three dimensions meets the ease of a pop-up with interchangeable, dye-sublimated fabric banners to create a multitude of looks on one display. More economical than a standard pop-up display. This display system is also very easy to assemble and takes less that 5 minutes to fully construct. Add to that the ability to change individual skins at any time without having to replace the entire graphic back drop, this makes the 3D Snap systems much more affordable in terms of graphic replacements. (1) Medium hard case with graphic fabric cover. 5-days upon approval of graphic proofs. Ships from the northwest.